Does your child have smelly feet? For those people who have experienced a gout attack in the past, or have a family member who has had this condition before, you know how painful and miserable it can be. The holiday season can also be a time which gout attacks can be triggered, and the Holiday Season is upon us and New Year’s Eve is just a few weeks away….So what is gout exactly? And how can I prevent it from happening to me, or someone I care about? Gout is a disorder that results from the build-up of uric acid crystals in tissues or a joint. It most often affects the joint of the big toe, because the toe is the coolest part of the body and uric acid is sensitive to temperature changes. However, other joints of the body can also be affected by gout. Changes in diet, including overindulging in certain foods and beverages, can cause a gout attack this time of year because often holiday foods and drinks are rich in purines. Foods and drinks that are high in purines contribute to uric acid build-up. Purines are converted to uric acid in the body. How is Gout Diagnosed by Your Podiatrist? How Can You Avoid A Gout Attack? Avoid purine-rich items such as shellfish (shrimp, crab, etc. ), organ meats (kidney, liver, etc. ), red meat, red wine, beer and other alcohol. Drink plenty of water and other fluids each day. Avoid alcoholic beverages, which can cause dehydration. How Do You Treat A Gout Attack? Gout pain and inflammation can be treated with Prescription medications (like Indocin, Colchicine, or steroids) or by injections of steroids. The symptoms of gout and the inflammatory process usually resolve in 3 to10 days with treatment. If gout symptoms continue despite the initial treatment, or if repeated attacks occur, treatment with maintenance medications may be needed. 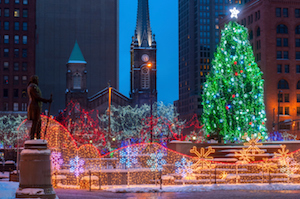 Enjoy the Holidays this festive time of year, but if you have a history of gout, remember to enjoy in moderation, otherwise this time of year may not be so festive for you! If you or a loved one fall victim to gout, please give our office a call, 440-442-3113. We are here to help! This rule really applies all year round. Do not squeeze your feet into boots that are too small. Make sure you have winter footwear that’s the right size and width to avoid crowding, discomfort and blister formation. Staying active outdoors during the cold winter months can be pretty difficult. Your feet need to stay warm, but trapping heat can lead to moisture build-up. To avoid this, our practice recommends wearing a light synthetic sock to keep moisture away from the feet then a thicker wool outer sock where moisture can be absorbed and evaporated to the outside. This is especially important for winter sports such as skiing, snowboarding and ice skating because stiff boots won’t allow evaporation. Feet easily become dry and cracked during the winter. You can avoid any skin discomfort by moisturizing daily with creams and lotions with rich ingredients such as shea butter or coconut oil. Just because you’re wearing boots this season and have put your sandals in the the closet for the winter doesn’t mean that you should ignore your feet until you pull your sandals back out again. You should keep your toenails trimmed to prevent ingrown toenails and exfoliate to remove excess skin. Buy shoes that are comfortable without a “breaking in” period. Check how your shoe fits in width, length, back, bottom of heel, and sole. Avoid pointed-toe styles and high heels. Try to get shoes made with leather upper material and deep toe boxes. Wear new shoes for only two hours or less at a time. Don’t wear the same pair every day. Inspect the inside of each shoe before putting it on. Choose socks and stockings carefully. Wear clean, dry socks every day. Avoid socks with holes or wrinkles. Thin cotton socks are more absorbent for summer wear. Avoid stockings with elastic tops. When your feet become numb, they are at risk for deformity. One way this happens is through formation of an ulcer. Ulcers also known as open sores may become infected. Another way is a bone condition referred to as Charcot (pronounced “sharko”) deformity. This is one of the most serious foot problems you can face as a diabetic. This condition causes the shape of your foot to change through the bones of your foot fracturing and disintegrating, as you continue to walk because it doesn’t hurt. Diabetic foot ulcers and early phases of Charcot fractures can be treated conservatively at our office. Please do not allow either condition to progress past the early phases. We are here to help. Please give our office a call at 440-442-3113. November is Diabetes Awareness Month and November 14, 2015 has been designated as World Diabetes Day. Are you or your loved a diabetic? If so, now is the time to schedule a yearly diabetic foot check-up. 29.1 Million Americans have diabetes, 8.1 million are unaware of their disease. Every 19 seconds, someone in the US is diagnosed with diabetes. Centers for Disease Control and Prevention. National Diabetes Statistics Report: Estimates of Diabetes and Its Burden in the United States, 2014. Atlanta, GA: U.S. Department of Health and Human Services, 2014. Reddy, M. Gill, S., Rochon, P. (2006) Preventing Pressure Ulcers: A Systematic Review. JAMA. 296(8): 974-984. Frykberg, Robert G. and Rogers, Lee C. “Emerging Evidence on Advanced Wound Care for Diabetic Foot Ulcers.” Proceedings from the Superbones West Conference in Las Vegas, Nevada. October 2010. Foot ulcers precede 85% of lower extremity amputations. Reiber, G. Smith, D. Vileikyte, L., Boyko, E., Aguila, M., Lavery, L., Boulton, A. (1999) Causal Pathways for Incident Lower-Extremity Ulcers in Patients with Diabetes from Two Settings. Diabetes Care. 22(1): 157-162. Every hour, ten Americans undergo amputation due to diabetes. In 2012, the total cost of diagnosed diabetes was $245 billion ($176 billion for direct medical cost and $69 billion for indirect costs like disability, work loss and premature mortality). The best way to prevent diabetic complications is to check your feet daily and keep regularly scheduled appointments with a podiatrist. Please give our office a call for an appointment, 440-442-3113. Does your child have smelly feet? Is your child afraid to take off their shoes while at a friend's house due to fear of embarrassment? If so, we are here to help. First, use antibacterial soap to clean your child's feet to address bacteria, which is a common cause of odor, daily. Additionally, be sure to alternate your child's shoes and have them wear fresh socks daily, as this can help to remove the presence of unpleasant smells. Sweat is another main cause of foot odor. Make sure the shoes are washed and cleaned regularly, and double check shoe sizes to be sure that they are not too tight on your child's feet. If smells continue to be stubborn, please call our office, 440-442-3113, for a consultation. Having healthy feet in childhood can help prevent medical problems later in life. As children grow, their feet require different types of care from birth to school-age. For more information about Keeping Children’s Feet Healthy, please visit our website and/or give our office a call, 440-442-3113, for an appointment. We are here to help! Summer is drawing to a close and kids will be returning back to school. If your back-to-school shopping has not started already, it soon will. Picking out new clothes, including footwear, is a big part of that, so this is a good time to share some shoe shopping tips for your children. Bring your child shoe shopping with you. Depending on age, children’s shoe sizes can change every couple of months as they grow. Additionally, every shoe is going to fit differently and this means the best practice is to have your child try on footwear in advance of purchasing them. Go shopping later in the day. Feet expand during the course of the day, so a pair that fits in the morning can be tight by the time night falls. This problem is easily avoided by simply heading out a little later to ensure the best possible fit throughout the entire day. Fit the pair to the larger foot. Feet are rarely the exact same size, so have both measured and find footwear based on the larger of the two. When you do, make sure there is a thumb’s width of space between the largest toe on that foot and the front of the shoe and also that the heel is properly cradled. Don’t plan on a “breaking-in” period. If a pair of shoes are not immediately comfortable, do not purchase them. The proper footwear can reduce the risk of foot injuries and conditions, but keep in mind that few are 100%avoidable. If your child needs expert care for any foot or ankle issue, please give our office a call. We are here to help! Many don’t realize skin cancer can occur on the feet from unprotected sun exposure, and overlook applying sunscreen to the area. Skin cancer of the foot is prevalent and can even be fatal if not caught early. We advise our patients to regularly inspect their feet, including the soles, in between their toes and even under their toenails, for any changing moles or spots and to have any suspicious areas promptly examined by our office. If you or someone who know has an abnormal lesion on their foot and/or ankle, please contact our office, 440-442-3113, for an appointment. Tendonitis, or tendinitis, is inflammation, irritation and swelling that affects a tendon. As you would expect, achilles tendinitis is inflammation of the tendon that links the two calf muscles at the back of the leg to the heel bone. The achilles tendon is the largest tendon in your body. It is used for walking, jumping and running. If you suffer from achilles tendinitis, you have likely experienced pain and inflammation at the bottom of your foot. Other symptoms include moderate to severe pain along the back of your leg, pain that worsens with increased activity, tightness of the tendon, thickening of the tendon, or a bone spur. Achilles tendinitis can be caused by excessive use or repetitive motion placing stress on the achilles tendon, such as in running and/or jumping rope. Rest: Resting is the first thing you should do when you start experiencing pain. Pain is an indication that something is wrong; therefore, it should not be ignored. Decrease or stop any activity that is worsening your symptoms. For example, if you are someone who regularly participates in high-impact exercises (running, jumping rope, jumping jacks, aerobics) that place additional stress on your achilles tendon, switch to low-impact exercises. Swimming, biking, walking, and rowing are great low-impact exercises that put minimal stress on the achilles tendon. Ice:Ice is another easy treatment because it can help reduce swelling, inflammation, and pain. Place an ice pack on the area of the achilles that is bothering you for up to 15 minutes a session. Be sure to remove the ice pack before numbness occurs. An ice pack can be used two to three times a day. Calf Exercises:Not all exercises increase stress on the achilles tendon. Calf stretching exercises can decrease stress and strain on the achilles tendon and strengthen the calf muscles. To start your calf exercises, brace yourself by placing both hands on a wall. Gently stretch out one leg behind you comfortably with your foot still flat on the floor. Put your opposite leg in front of you, ensuring your knee is slightly bent. Push your hips forward towards the wall in front of you and hold for 10 seconds. You should feel a moderate pull in your calf. Repeat 10 times on each leg. If you live in the Cleveland area and your pain persists after using these tips, you should contact our office to schedule an appointment. We are here to help! Over-training or Over-activity. Extensive training and high-impact sports, especially running, places an abnormal amount of stress on the balls of the feet, causingirritation, inflammation and pain. Although generally not serious, metatarsalgia can disrupt your day to day activities, and when left untreated can lead to additional pain in your unaffected foot, back or hips. Treatment to eliminate metatarsalgia symptoms can be as simple as resting, icing the affected area and wearing proper-fitting shoes to significantly reduce swelling and ease pain. When conservative treatments are not effective and pain persists please contact our office for an appointment. 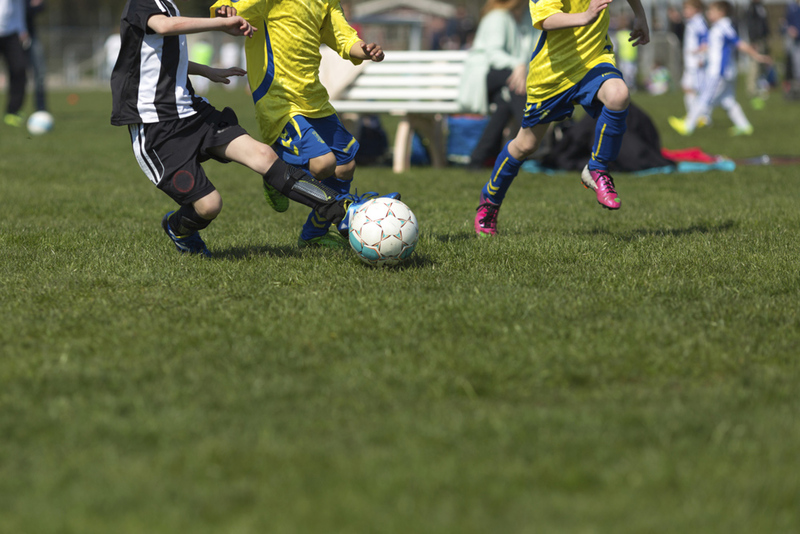 Spring soccer season will soon be in full swing; don’t let your child be sidelined by toe pain. Tight or hand me-down cleats combined with repetitive kicking can lead to painful ingrown toenails. It’s a common condition among all age groups, especially children. A nail becomes ingrown when its corners or sides grow into the. skin of the toe, causing discomfort, redness, swelling and sometimes infection. Make sure children’s sports and day-to-day shoes fit properly. Improper shoe width often contributes to ingrown toenails. It is important for the widest part of the shoe to match the widest part of your child’s foot. Teach children how to trim their toenails properly. Toenails should be trimmed straight across and not cut too short. Make it a habit to check your children’s feet starting at a young age. Oftentimes kids hide their foot pain from their parents. If your child develops an ingrown nail, the only permanent cure is with a minor procedure performed at our office. Don’t ever try to dig the nail out or cut it off yourself. These dangerous “bathroom surgeries” carry a high risk for infection. As always, we are here to provide care for your entire family. If you have questions about your child’s feet, don’t hesitate to contact our office, 440-442-3113. 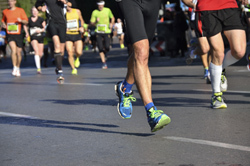 The growing popularity of marathons among beginning runners has contributed to the increase in repetitive stress injuries, including stress fractures of the foot. Often, first-time marathoners enter a race with little or improper long-distance training. The lack of experience coupled with the repetitive impact placed on the feet during the run can produce enough stress to cause hairline breaks in the bones of the foot. Runners who increase their mileage too quickly or change to a more intense phase of training may be more susceptible to a stress fracture due to the increased force placed on the bones. A general rule of thumb for runners is to increase the mileage by no more than 10 percent each week. Runners who are training also need to have adequate rest time in between runs to help decrease the risk of a fracture. Runners at all levels of experience are also at higher risk for stress fractures if they wear improper shoes while running or training, suffer from flat foot or other foot deformities, or have osteoporosis. Signs of a stress fracture can include pain, swelling, redness and possibly bruising of the area. Stress fractures can occur anywhere in the foot and can eventually lead to a complete break of the bone if left untreated. Early diagnosis and treatment are important to ensure proper healing. If a break is suspected, runners must immediately follow the RICE protocol—Rest, Ice, Compression and Elevation. If pain and swelling last longer than a few days, an appointment for an x-ray and diagnosis is in order. Runners can take action to prevent repetitive stress injuries in their feet by wearing supportive athletic shoes and slowly building up their activity levels according to their abilities. If a runner suffers from abnormal mechanics in the foot, such as over pronation or hypermobility, custom orthotics can also be helpful to prevent these injuries. If you suspect you have a foot injury or fracture, please call our office, for evaluation and treatment, 440-442-3113. If children lag behind in sports or backyard play, it may be because their feet or legs are tired. Fatigue is common when children have flat feet. The muscles in the feet and legs tire easily because the feet are not functioning as well as they should. If they are reluctant to participate, it may be due to heel pain — a problem often seen in children between the ages of 8 and 14. Repetitive stress from sports may cause muscle strain and inflammation of the growth plate, a weak area at the back of a child’s heel. Children may feel pain or notice a change in the appearance of their feet or nails but don’t tell their parents because they fear a trip to the doctor’s office. Therefore, parents should make it a habit to inspect their child’s feet starting at a young age. Look for any changes such as calluses, growths, skin discoloration, or redness and swelling around the toenails. It is never normal for a child to have foot pain. Injuries may seem minor, but if pain or swelling last more than a few days, have your child’s foot examined. If you’ve noticed any of these signs in your children, please call our office for an assessment. Here are some frequently asked questions and answers about bunions and their treatment provided by the American College of Foot and Ankle Surgeons. Do over-the-counter pads and splints really work? Will my bunion get worse? Because bunions are progressive, they don't go away, and will usually get worse over time. But not all cases are alike. Some bunions progress more rapidly than others. Is it better to have it fixed now, or should I wait? Sometimes observation of the bunion is all that's needed. A periodic office evaluation and x-ray examination can determine if your bunion deformity is advancing, thereby reducing your chance of irreversible damage to the joint. In many other cases, however, some type of treatment is needed, such as changes in shoes, padding, activity modifications, pain medications, icing, injection therapy, and/or orthotic devices. When the pain of a bunion interferes with daily activities, it's time to discuss surgical options with your foot and ankle surgeon. Together you can decide if surgery is best for you. Will my insurance company pay for the surgery? In most cases, yes, however contact your insurance to verify coverage. The amount of pain experienced after bunion surgery is different from one person to the next. Most patients will experience discomfort for three to five days. If you closely follow your foot and ankle surgeon's instructions, you can help minimize pain and swelling after your bunion surgery. If I need surgery, how long will recovery take? Will I be able to walk normally, or even exercise and run, after healing from bunion surgery? How soon can I walk after surgery? How soon can I go back to work after surgery? Can the bunion come back? Yes, there is a risk for bunion recurrence in some cases. Patients can help prevent this by following their doctor's instructions to wear arch supports or orthotics in their shoe. If screws or plates are implanted in my foot to correct my bunion, will they set off metal detectors? With the past winter storm this weekend and the numerous we experience this time of year, serious injuries from ice-related falls occur inevitably. Falls on icy surfaces are a major cause of ankle sprains and fractures, and it’s critical to seek prompt treatment to prevent further damage that can prolong recovery. Ice accelerates the fall and often causes more severe trauma because the foot can go in any direction after slipping. In cases of less severe fractures and sprains, it’s possible to walk and mistakenly believe the injury doesn’t require medical treatment. Never assume the ability to walk means your ankle isn’t broken or badly sprained. Putting weight on the injured joint can worsen the problem and lead to chronic instability, joint pain and arthritis later in life. Most ankle fractures and some sprains are treated by immobilizing the joint in a cast or splint to foster union and healing. However, surgery may be needed to repair fractures with significant mal-alignment to unite bone fragments and realign them properly, therefore medical attention is required immediately. If you have injured your ankle in any way please give our office a call to schedule an appointment, 440-442-3113. You don’t have to be an accomplished athlete like the ‘Wild Thing” Anderson Varejao from the Cleveland Cavaliers to suffer Achilles tendon injuries. They can happen from household tasks like climbing a ladder. Achilles tendon weakness is common in adults, but seeking treatment when symptoms occur can prevent more serious injury. Achilles tendonitis is common for anyone whose work routinely puts constant stress on their feet and ankles. Achilles tendon injuries happen most often to less conditioned, ‘weekend warrior’ athletes who overdo it. But it can also happen to those who may simply climb a ladder too quickly. Individuals risk further deterioration and possible rupture when they don't seek medical care for Achilles tendon injuries. The main symptoms of Achilles tendonitis is pain, which occurs in the morning, improves with motion, but gets worse with increasing stress and activity, stiffness and tenderness. Major causes of Achilles tendon injuries involve jumping and running. In sports like basketball and tennis, muscles and tendons in the back of the leg are prone to injury from an imbalance that occurs from a lot of forward motion. As a result, the frontal imbalance can weaken the tendon unless stretching exercises are performed regularly. If you or someone you know has symptoms of Achilles tendonitis, please contact our office for a consultation, 440-442-3113, we are here to help! As temperatures dip across the United States, the prospect of a long winter and slippery conditions is at the forefront of everyone's mind. But as we continue to unpack our winter clothes and re-stock our snow removal essentials, awareness of cold-weather related injuries - and appropriate treatments - is an equally important precaution. Throughout the winter months, some hospitals report up to a 500 percent increase in emergency room visits, in part due to injuries from slips and falls. Stress fractures, a hairline crack in a bone of the foot, are one of the more common winter-related injuries, and can make seemingly easy activities like walking very painful; if left untreated, these injuries can lead to a complete break in the bone. Stress fractures are often ignored by people who do not make the connection between a recent activity or accident and related foot pain. According to the American College of Foot and Ankle Surgeons, stress fractures can occur in a wide variety of seemingly benign circumstances. Athletes are commonly afflicted, as repetitive weight bearing activities such as running, gymnastics, and other sports are often sources of stress on the foot. But in the winter months, slippery walking conditions and seasonal sports like ice skating, snowboarding and sledding are some of the leading causes of foot-related injuries. Even standing on a hard floor for too long can produce a stress fracture. Our practice has treated several patients with stress fractures in December after they volunteered at a local food drive or soup kitchen over the holiday season. It's important to be aware of the signs of a stress fracture, especially following a potentially stressful activity or fall, and to seek appropriate care. Pain, swelling, redness, and possibly bruising can all be signs of a stress fracture. The pain typically occurs on the top of the foot. The symptoms usually pop up quickly and then subside if the person stops the activity. Although the foot may feel better with rest, pain often comes back once activity is resumed. At this point in time, people with stress fractures may experience a deep, aching pain that's extremely bothersome. For those who still have symptoms after resting, icing, and using anti-inflammatory medication at home, it's important to see a specialist. Podiatrists can quickly diagnose stress fractures through a physical examination and, if medically indicated, taking imaging studies. Beginning treatment as soon as possible is very important and may shorten your recovery time. Treatment can take four to six weeks if you catch the problem early. During this time, it's important to rest the foot and possibly wear a surgical shoe or cast boot. In a small percentage of patients, surgery may be needed to stabilize the fracture. It's not unusual for stress fractures to recur in some people. This is especially true among those who have a certain foot shape or fragile bones. Whether it's a first-time occurrence or a recurrence, proper treatment of a stress fracture is important, and that includes giving your foot the full rest that it needs. If you or someone you know is suffering from a stress fracture please give our office a call, 440-442-3113. 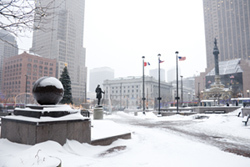 With the extreme cold front hitting Cleveland currently, here is some important information regarding frostbite, a condition that can occur with these dangerously cold temperatures. Frostbite occurs when a body part is exposed to extreme cold. If conditions are cold enough for the water within the tissues to freeze and form ice crystals, cell death can occur. The feet, hands, ears and nose are particularly prone to frostbite due to their location away from the body’s core. Frostbite can be prevented by limiting exposure and keeping the feet as warm and dry as possible. If, however, frostbite is suspected, the feet should be rapidly re-warmed by immersion in warm water (approximately 100 degrees Farenheit). Avoid vigorous rubbing/massaging and dry heat (such as from a hair dryer), as burns may result if numbness is present. To avoid infection, blisters or damaged skin should be treated by medical personnel, therefore, contact our office for an appointment, 440-442-3113, immediately.